The 17th edition of Medical Knowledge Self-Assessment Program (MKSAP (R) 17) is specifically intended for physicians who provide personal, nonsurgical care to adults. Included are: general internists and primary care physicians; subspecialists who need to remain up-to-date in internal medicine; residents preparing for the Certification Exam in internal medicine; physicians preparing for the Maintenance of Certification Exam in internal medicine. The learning objectives of MKSAP (R) 17 are to:Close gaps between actual care in your practice and preferred standards of care, based on best evidence.Diagnose disease states that are less common and sometimes overlooked and confusing.Improve management of comorbid conditions that can complicate patient care.Determine when to refer patients for surgery or care by subspecialists.Pass the ABIM Certification Examination and the ABIM Maintenance of Certification Examination.MKSAP (R) 17 Pulmonary and Critical Care Medicine includes coverage of pulmonary diagnostic tests, asthma, COPD, diffuse parenchymal lung disease, pleural disease, pulmonary thromboembolism, pulmonary hypertension, lung cancer, sleep medicine, high-altitude illness, respiratory failure, shock, mechanical ventilation, sepsis, anaphylaxis, and delirium. It includes 108 multiple-choice questions. 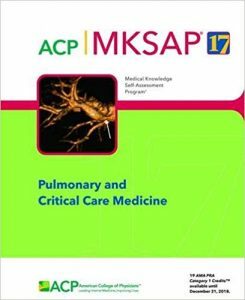 In this part of the article, you will be able to access the .pdf file of MKSAP 17 Pulmonary and Critical Care Medicine PDF. The newly introduced Specialty Certificate Examinations are a compulsory component of assessment for all UK medical trainees and represent the final examination barrier before getting the certificate of completion of training. 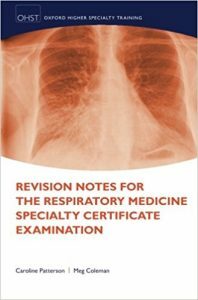 This book provides a unique exam-specific revision guide for the Respiratory specialty certificate exam. 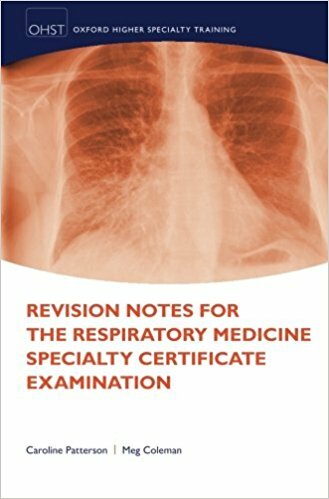 Comprising of best of five test multiple choice questions and revision notes to facilitate targeted study, Revision Notes for the Respiratory Medicine Specialty Certificate Examination is the only book you need to prepare for this important examination. Questions are based around clinical scenarios and supplemented with images of radiological investigations such as x-rays, and lung function tests. Each question is structured as in the exam itself. 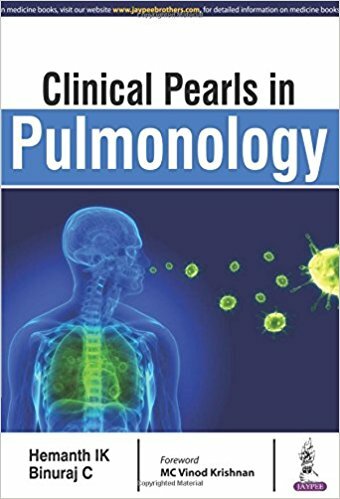 The second half of the book comprises of a series of tutorials covering key areas and difficult concepts assessed in the examination including respiratory infection, respiratory malignancy, industrial lung disease, sleep disorders, standard respiratory tests and medical statistics. The combined approach allows trainees to become acquainted with the “best of five” format and facilitate recognition of areas of weakness and targeted study. 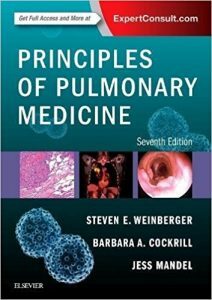 Offers access to extensive online resources, including author commentaries, video clips, audio recordings of lung sounds, and 200 case-based self-assessment questions – covering topics including pulmonary function tests, physiologic data, and arterial blood gas testing and modeled after the USMLE exam. 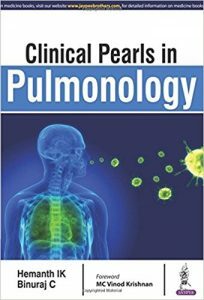 Covers all that’s new in the field, including new CT lung cancer screening guidelines; new concepts in the pathogenesis of asthma, interstitial lung disease, and other pulmonary diseases; and evolving therapies for idiopathic pulmonary fibrosis, pulmonary hypertension, and advanced lung cancer. Use this authoritative guide as an on-the-job reference ― and to prepare for the CPFT and RPFT credentialing examinations! 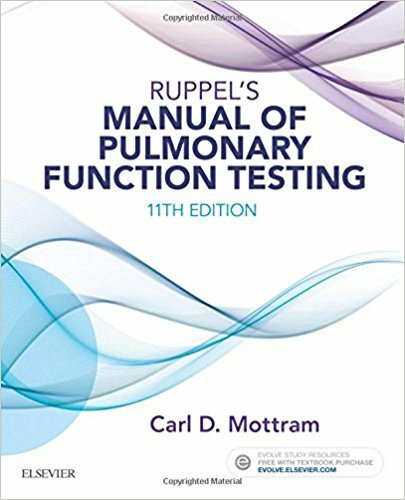 Ruppel’s Manual of Pulmonary Function Testing, 11th Edition provides comprehensive coverage of common pulmonary function tests, testing techniques, and the pathophysiology that may be evaluated by each test. It also includes information on equipment, computers, and quality assurance, so you can develop the testing skills you need to find and assess lung abnormalities and conditions including asthma, COPD, emphysema, and cystic fibrosis. 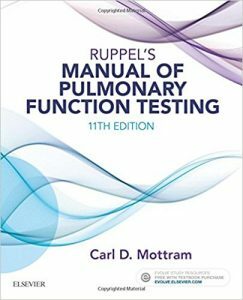 Written by Carl Mottram, a well-known expert in pulmonary function procedures, this bestselling guide helps you get accurate test results every time. 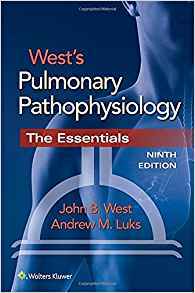 West’s Pulmonary Pathophysiology: The Essentials offers accessible explanations of disease processes that affect the respiratory system. This best-selling companion to West’s Respiratory Physiology, Tenth Edition, has served generations of students. Dr. John B. West, together with new co-author Dr. Andrew M. Luks, presents the vital knowledge you need in a concise, straightforward manner that’s easy to understand. Learn the very latest on COPD, asthma, restrictive lung disease, pulmonary hypertension, and much more. See how pathophysiology applies to clinical practice with clinical vignettes in every chapter, followed by multiple-choice questions and answers to test your comprehension. Visualize concepts vividly with the aid of new radiographs, CT images, and color photomicrographs. Study with ease through abundant chapter outlines, Key Concepts boxes, bulleted review sections, and other helpful summaries. Prepare for exams with 75 multiple-choice review questions, accompanied by answers and explanations, inside the book as well as in an Interactive Question Bank online. The role of bronchoscopy in the evaluation and treatment of respiratory disease has evolved dramatically over the last decade. Originally a tool for examining and sampling the central endobronchial tree, it has broadened considerably to include techniques that now enable the treatment of an increasing number of conditions. In this ERS Monograph, the Guest Editors make this broad area easy to navigate by separating the book into three sections: technical aspects, diagnostic procedures, and therapeutic interventions. 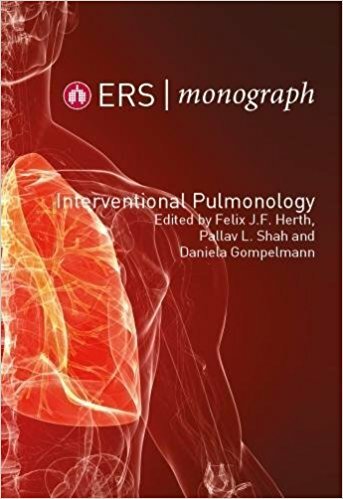 Within these sections, leading authors in the field provide chapters that include: flexible and rigid bronchoscopy, bronchoscopy in intensive care, laryngoscopy, biopsy techniques, EBUS and EUS, cryobiopsy, early cancer therapies and airway stents. Chest Radiology: A Resident’s Manual is a comprehensive introduction to reading and analyzing radiologic cardiopulmonary images. Readers are guided through systemic image analysis and can further enhance their learning experience with training cases found at the end of each chapter. Cases describe and discuss frequently asked questions regarding heart failure, bronchitis, pneumonia, bronchial carcinoma, fibrosis, pleural disorders, and more. This user-friendly manual will allow the reader to confidently answer the most important and commonly encountered questions related to plain chest radiographs in daily clinical practice. The easy-to-read layout pairs explanatory text on the left page with related drawings and images on the right, allowing readers to navigate their way through each section with ease. 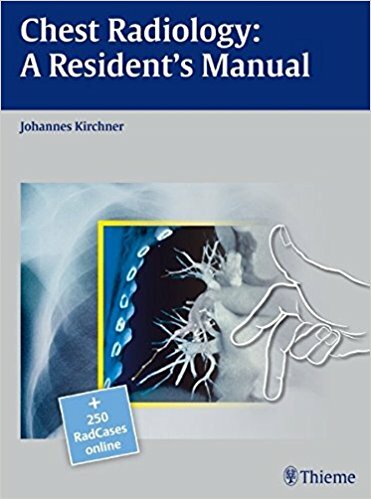 This practice-oriented manual is an invaluable resource and reference guide for residents and radiologists-in-training. The third edition of this bestselling book provides new material on sleep disordered breathing, new methods for the staging of lung cancer, interstitial lung diseases and infections — all of which have grown in importance since the previous edition. 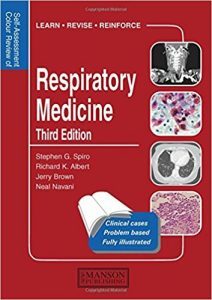 The traditional areas of respiratory medicine remain strongly represented and the new edition contains many new radiological illustrations. The book contains integrated self-test questions, illustrations and detailed explanations. It is designed to educate as well as give answers to problems. The cases appear in random order and at varying levels of difficulty, mimicing how patients present in practice. The Color Review will appeal to a wide readership, ranging from senior medical students and post-registration trainees in internal medicine, to pulmonologists in training and practice, for examination revision and continuing education. 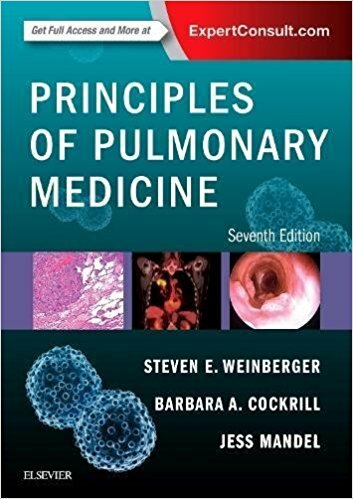 …the questions in this book cover many diverse areas of respiratory medicine… the strength of this book is the format, which makes it interesting to clinicians and highlights the clinical approach to a patient… helps aid education… relevant and interesting… will appeal to a wide readership, ranging from senior medical students, to trainees in internal medicine, and to pulmonologists in training and practice. MRCP candidates will undoubtedly find this a useful aid to revision and it provides an entertaining collection of vignettes for the established clinician. Thoroughly recommended.